Zeolites are an extremely useful group of minerals characterized by a microporous structure—that is, a structure with minute pores. Chemically, they are alumino-silicate minerals that can lose and absorb water and various ions and gases without damage to their crystal structures. The cations in their pores are generally those of alkali metals (such as Na+ and K+) or alkaline earth metals (such as Ca2+ or Mg2+). These positive ions are loosely held and can be readily exchanged for others in a contact solution. About 48 naturally occurring zeolites are known, and more than 150 types have been artificially synthesized. Some of the common mineral zeolites are analcime, chabazite, heulandite, natrolite, phillipsite, and stilbite. The names of some useful synthetic zeolites are A, X, Y, and ZSM-5 (or ZMS-5). The mineral formula of natrolite, for instance, is: Na2Al2Si3O10-2H2O. Natural zeolites are useful for such applications as horticulture (soil conditioners and growth media), wastewater treatment, animal feed, and pet litter. Synthetic zeolites are used as catalysts, detergents, and molecular sieves. The zeolite known as thomsonite has been used as a gemstone. 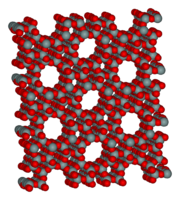 The microporous molecular structure of a zeolite, ZSM-5. The term zeolite was originally coined in the eighteenth century by the Swedish mineralogist Axel Fredrik Cronstedt. He found that rapid heating of a natural mineral caused the stones to dance about as the water within their pores evaporated. He combined the Greek words zein (meaning "to boil") and lithos (meaning "a stone"), to indicate a "stone that boils." Natural zeolites form where volcanic rocks and ash layers react with alkaline groundwater. Zeolites also crystallized in post-depositional environments over periods ranging from thousands to millions of years in shallow marine basins. Naturally occurring zeolites are usually found as mixtures with other minerals, metals, quartz, or other zeolites. They are therefore excluded from many important commercial applications where uniformity and purity are essential. Conventional open pit mining techniques are used to mine natural zeolites. The overburden is removed to allow access to the ore. The ore may be blasted or stripped for processing by using tractors equipped with ripper blades and front-end loaders. In processing, the ore is crushed, dried, and milled. The milled ore may be air-classified as to particle size and shipped in bags or bulk. The crushed product may be screened to remove fine material when a granular product is required, and some pelletized products are produced from fine material. Producers also may modify the properties of the zeolite or blend their zeolite products with other materials before sale to enhance their performance. Currently, the world’s annual production of natural zeolite is about 4 million tons. Of this quantity, 2.6 million tons are shipped to Chinese markets to be used in the concrete industry. Eastern Europe, Western Europe, Australia, and Asia are world leaders in supplying the world’s demand for natural zeolite. By comparison, only 57,400 metric tons of zeolite (only 1 percent of the world’s current production) is produced in North America. Only recently has North America realized the potential for current and future markets. There are several types of synthetic zeolites that form by a process of slow crystallization of a silica-alumina gel in the presence of alkalis and organic templates. An important process for zeolite synthesis is known as "sol-gel" processing. The product's properties depend on such factors as composition of the reaction mixture, pH of the system, operating temperature, pre-reaction "seeding" time, reaction time, and the templates used. In the sol-gel process, other elements (metals or metal oxides) can be easily incorporated. The silicalite sol formed by the hydrothermal method is very stable. Also the ease of scaling up this process makes it a favorite route for zeolite synthesis. Synthetic zeolites hold several key advantages over their natural analogs. For instance, the synthetics can be manufactured in a uniform, pure state. In addition, it is possible to manufacture desirable zeolite structures that do not appear in nature. Zeolite A is a well-known example. Since the principal raw materials used to manufacture zeolites are silica and alumina, which are among the most abundant mineral components on earth, the potential to supply zeolites is virtually unlimited. Finally, human engineered processes are significantly faster than natural processes. Disadvantages include the inability to create crystals with dimensions of a comparable size to their natural counterparts. Zeolites are the aluminosilicate members of the family of microporous solids. On a molecular level, they generally consist of a framework of interlocking tetrahedra of SiO4 and AlO4. This framework is negatively charged, and its pores contain loosely bound cations that neutralize the charge. The pores are large enough to accommodate small molecules, such as water and ammonia, and polyatomic ions such as carbonate and nitrate. Zeolites can therefore lose and absorb water and various ions and gases without damage to their crystal structures. These materials function as "molecular sieves"—that is, they can selectively sort molecules based on their sizes. This ability is based on their regular pore structure of molecular dimensions. The maximum size of the molecular or ionic species that can enter the pores of a zeolite is controlled by the diameters of the tunnels. These are conventionally defined by the ring size of the aperture. For example, the term "8 ring" refers to a closed loop built from 8 tetrahedrally coordinated silicon (or aluminum) atoms and 8 oxygen atoms. These rings are not always perfectly flat and symmetrical due to various factors, such as strain induced by the bonding between units in the overall structure, or coordination of some oxygen atoms of the rings to cations within the structure. Therefore, the pore openings for all rings of one size are not identical. Zeolites are widely used as ion-exchange beds in domestic and commercial water purification, softening, and other applications. In chemistry, zeolites are used to separate molecules of different sizes and as traps for molecules that need to be analyzed. Zeolites have the potential to provide precise separation of gases, including the removal of H2O, CO2, and SO2 from low-grade natural gas streams. Other gases that can be separated include noble gases, nitrogen, freon, and formaldehyde. Currently, however, the true potential to improve the handling of such gases in this manner remains unknown. Synthetic zeolites are widely used as catalysts in the petrochemical industry, for instance in Fluid Catalytic Cracking and Hydro-Cracking. Zeolites confine molecules in small spaces, which causes changes in their structure and reactivity. The hydrogen form of zeolites (prepared by ion-exchange) are powerful solid-state acids, and can facilitate a host of acid-catalyzed reaction, such as isomerization, alkylation, and cracking. Zeolites have uses in advanced reprocessing methods, where their microporous ability to capture some ions while allowing others to pass freely allow many fission products to be efficiently removed from nuclear waste and permanently trapped. Equally important is the mineral properties of zeolites. Their alumino-silicate construction is extremely durable and resistant to radiation even in porous form. Additionally, once they are loaded with trapped fission products, the zeolite-waste combination can be hot pressed into an extremely durable ceramic form, closing the pores and trapping the waste in a solid stone block. This is a waste form factor that greatly reduces its hazard compared to conventional reprocessing systems. In agriculture, clinoptilolite (a naturally occurring zeolite) is used as a soil treatment. It provides a source of slowly released potassium. If previously loaded with ammonium ions, the zeolite can serve a similar function in the slow release of nitrogen for plant growth. Cuban studies in the emerging field of "zeoponics" suggest that some crops may be grown in 100 percent zeolite or zeolite mixtures in which the zeolite is previously loaded or coated with fertilizer and micronutrients. Zeolites can also act a water moderators, whereby they will absorb up to 55 percent of their weight in water and slowly release it under plant demand. This can prevent root rot and moderate drought cycles. A potting soil with 12 percent clinoptilolite was shown to harvest morning dew and return it to the plant roots for reuse. The same bed was able to grow a Jerico strain of leaf lettuce in a subtropical climate without external water and daytime temperatures exceeding 85 °F. This produce went full term before setting seeds. In concentrated animal growing facilities, the addition of as little as 1 percent of a very low sodium clinoptilolite was shown to improve feed conversion, reduce airborne ammonia up to 80 percent, act as a mycotoxin binder, and improve bone density. Zeolite-based oxygen generation systems are widely used to produce medical grade oxygen. The zeolite is used as a molecular sieve to create purified oxygen from air, in a process involving the absorption of undesired gases and other atmospheric components, leaving highly purified oxygen and up to 5 percent argon. Also, a zeolite-like material (registered as QuikClot) is available for quickly clotting severe bleeding. It has proven useful in treating some victims of war, crimes, and accidents. Zeolites can be used as solar thermal collectors and for adsorption refrigeration. In these applications, their high heat of adsorption and ability to hydrate and dehydrate while maintaining structural stability is exploited. This hygroscopic property, coupled with an inherent exothermic reaction when transitioning from a dehydrated to a hydrated form (heat adsorption), make natural zeolites effective in the storage of solar and waste heat energy. The largest outlet for synthetic zeolite is the global laundry detergent market. This amounted to 1.44 million metric tons per year of anhydrous zeolite A in 1992. Synthetic zeolite is also being used as an additive in the production process of warm mix asphalt concrete. The development of this application started in Germany in the 1990s. It helps lower the temperature level during manufacture and laying of asphalt concrete, resulting in lower consumption of fossil fuels and reduced release of carbon dioxide, aerosols, and vapors. When added to Portland cement as a pozzolan, it can reduce chloride permeability and improve workability. Thomsonite nodules have been collected as gemstones from a series of lava flows along Lake Superior in Minnesota and to a lesser degree in Michigan. These nodules, which have eroded from basalt lava flows, have concentric rings in combinations of colors such as black, white, orange, pink, red, and many shades of green. Some nodules have copper inclusions and are occasionally found with copper "eyes." When polished by a lapidary, the thomsonites sometimes display chatoyancy. Zeolites are marketed by pet stores for use as a filter additive in aquariums, to absorb ammonia and other nitrogenous compounds. However, due to the high affinity of some zeolites for calcium, they may be less effective in hard water and may deplete calcium. Zeolite filtration is used in some marine aquariums to keep nutrient concentrations low for the benefit of corals adapted to nutrient-depleted waters. ↑ U.S. Geological Survey, 2004. ↑ U.S. Patents 4,917,045 and 6,284,232. ↑ New Scientists, Z-Medica, the manufacturer of QuikClot, claims that the granulated material can be poured directly on the wound to stop high-volume bleeding almost instantaneously. Retrieved April 12, 2007. Mineral Gallery. 2006. The Zeolite Group of Minerals. Amethyst Galleries. Retrieved April 12, 2007. Virta, Robert. 2006. Zeolites: Statistics and Information. U.S. Geological Survey, U.S. Dept. of the Interior. Retrieved April 12, 2007. All links retrieved July 5, 2013. This page was last modified on 5 July 2013, at 15:26.